This is the Triple Herald Elementalist Blade Vortex build - my attempt to make the Elementalist great again. Great all-rounder, viable for all content. Please don't pm your questions to me directly, post them in this thread. If you have problems with your character, read the FAQ section first. Fairly cheap to gear, not gated behind rare/expensive uniques. Good league starter, SSF is possible. Scales exceptionally well in the end-game. The renewed Elementalist ascendancy offers a good synergy with the Blade Vortex skill and the heralds. The Pendulum of Destruction gives a very visible and welcome AoE boost or elemental damage boost when you need it. So when using the Mastermind of Discord ascendancy with all three Heralds you get that 25% elemental penetration on everything. With the Shaper of Desolation all your hits - not just critical ones - apply elemental ailments. The Beacon of Ruin makes your elemental ailments stronger and spreads them to all nearby enemies. * Over 200% increased life can get you up to 7k hp if you invest into it. With Mind over Matter you can get up to 8k EHP. * The damage is great so you kill most everything before they get to hit you. * Lots of cold damage means that things get chilled and frozen all the time. * Herald of Ice shatters almost everything so you leave no bodies for that nasty detonate dead or those pesky porcupines. * Very agile with Whirling Blades as a movement skill - threats are easy to dodge. Also fortify. Note that leech is mandatory for this build. Do not omit warlord's mark curse. The most notable change is that we now take the Spiritual Aid cluster, specifically for its "Increases and Reductions to Minion Damage also affect you" notable property. The reason why it matters is that the minion damage modifiers become global and therefore boost all heralds as well as Inpulsa explosion damage. It also allows us to utilize the 40% damage bonus from Bone Helmets, resulting in 109% increased global damage. We also allocate Celestial Judgement getting 36% increased generic elemental damage as well as 5% elemental penetration. These changes compensate the Inpulsa explosions nerf and considerably buff the heralds damage. Late in the game once you have good weapons that ideally have mods that scale Inpulsa damage (generic elemental, lightning, or area damage) and have access to great jewels, you can refund the Spiritual Aid cluster nodes and take jewel slots instead. MoM is optional, good early on but once you get enough life it can be refunded. Spare mana can then be allocated to use Herald of Purity or Aspect of the Spider. * Go for the second curse with the Whispers of Doom cluster. Use Herald Of Thunder / CWDT setup same way it was used for Warlords Mark before the ring. Use Enfeeble for safety or Elemental Weakness for extra dps. Help Alira (or take 2 points). Aim to have at least 70 life on every rare piece of gear. Do not overlook mana regen and flat mana mods. Always make sure your elemental resists are capped. Dual wield either 2 Daggers, or Dagger and Foil, or 2 Foils. Shield is also an option if you prefer to use Shield Charge as a movement skill, it is faster and arguably better for mapping where you don't need to maximize your damage output. You can use scepters with shields. Inpulsa's Broken Heart is the BiS armor for this build. It boosts both single target damage (via the increased shock effectiveness and increased damage mods) and AoE (via the shocked enemies you kill explode mod). Until you obtain Inpulsa's, use any rare or unique armor, preferably with life and resists. Very common drop, provides 30-40% global damage increase when the Spiritual Aid notable is allocated. Good choice early in the league or for SSF. Lots of life, crit chance, attack speed and very importantly up to 70 dex - this build can be dex starved. Alternatively use any rare helmet with life and resists. Best helmet lab enchantment is 30% increased blade vortex duration. Important part of the build to get the 50% cold conversion. Very common and cheap item. Fated version (Hrimburn) is only marginally better, don't chase it but upgrade if the opportunity arises. In the Betrayal league it is possible to craft double conversion gloves that would be a better choice since they can have other useful mods as well (life, resists etc). Rare boots with movement speed, life and resists. Stygian vise with life and resists. If you are rich then look for shaped amulets with the Gain % of physical damage as [element] damage mod on top of the above. 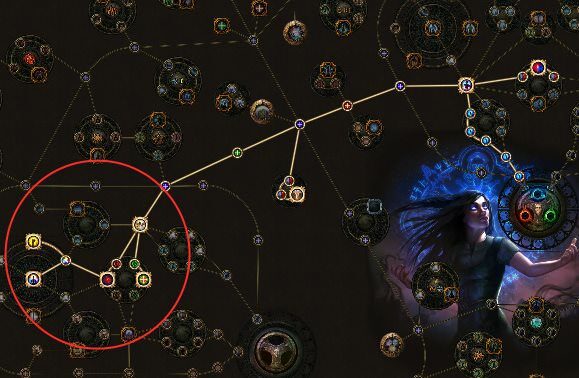 Yoke of suffering https://pathofexile.gamepedia.com/Yoke_of_Suffering is a good damage option but unfortunately it doesn't have any life on it. Life and resists. Cast speed, mana regen and flat mana is a bonus. Warlord's mark curse ring for leech and extra tankiness (endurance charges). Note that this ring is recommended but not required. If you can't get one you will need to obtain warlord's mark curse from gems. It will be explained later in the Gems and links section. Crit multi, Life and some extra damage mod(s). Craft antibleed, antifreeze and curse immunity. Replace Quicksilver flask with Basalt or Taste of Hate once you start using Whirling Blades. Wise Oak can be an excellent option but only if you manage to balance all your elemental resistances. Flasks management is very important for this build. You can almost double your damage output by using all your utility flasks at once. Replace Added Fire Damage with Hypothermia once you get the Beacon of Ruin ascendancy node. Last slot is situational. Use Conc effect on tough bosses, and a support of your choice for mapping. If using shield replace Whirling Blades with Shield Charge if you like it better. If using MoM replace Culling strike with Blood Magic. This is the "give me more juice" button. Arcane surge gives 13% more damage, extra cast speed to spin up the blades faster and some mana regen on top of that. And you also get power charges when it crits. If you are already using PCoC with Blade Vortex, replace it with Blind here. 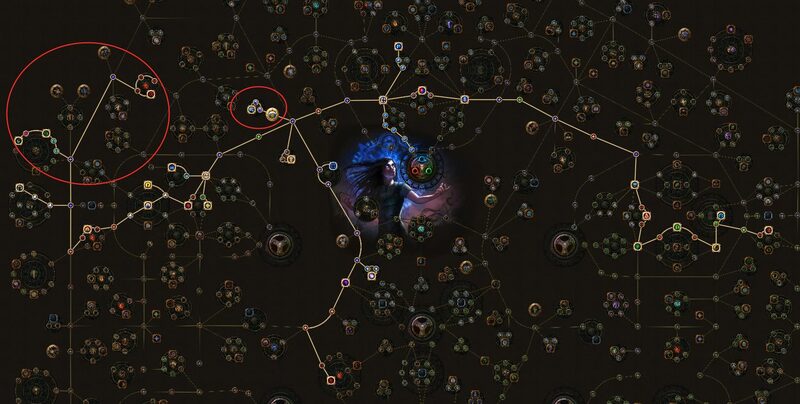 Important: keep Arcane surge low level so it gets triggered by a single cast of orb of storms. Lightning golem is the best for this build. Allows to move faster with whirling blades or shield charge as well as spin up vortex blades quicker. We use all three heralds: Ash, Ice and Thunder. Herald of Ash doesn't hit and doesn't trigger any on kill events, so just leave it alone and use as is. Herald of Thunder is going to be linked to Curse On Hit - Warlord's Mark gems. This doesn't reserve any extra mana and reliably curses enemies around you while exping. The fourth link is going to be Blind - our chance to evade jumps to over 50% against blinded enemies. Do not use this setup with Inpulsa's armor as it steals herald's kills most of the time. This will however reserve a lot of mana so you will need to either switch to Watcher's jewel based mini-MoM or unspec MoM altogether which would have a negative impact on survivability. If you are not using MoM you can squeeze Herald of Purity in as the 4th herald. This setup serves two purposes: it triggers Immortal Call to prevent all physical damage for the duration, and also casts the Warlord's Mark curse. The latter is required in single target situations (bosses) where the curse cannot be applied by the herald. You don't want to keep your CWDT too low level as you don't want your endurance charges to be consumed every time someone looks at you funny. Level 12 appears to be a good balance, although you may keep it lower early on. You can use blood rage if you can sustain it (have enough regen). * Add Frost Bomb to your CWDT setup. It adds 25% cold penetration when triggered and we do deal quite a big deal of cold damage. It also greatly reduces enemies life regen which is useful against high regen targets. * Link golem to CWDT to have it automatically resummoned. * Link heralds to Enlighten support to free up a bit more mana for MoM. * Add Blind to Orb of Storms setup. * Add Flame Dash as an extra movement skill for lab or rough terrain when you need to jump which you cannot do with whirling blades or shield charge. Simply keep on spinning and whirling blade into packs while popping flasks. Everything gets chilled, shocked and frozen and then just explodes. Drop orb of storms to get arcane surge going, spin up to max blades, pop flasks and go to town. Use Concentrated Effect if your dps is lacking. Pick Witch starting spell damage nodes followed by life/mana nodes. Level with Freezing pulse, switch to Arc or Firestorm at level 12 if you like, or start using blade vortex straight away although it is going to feel clunky early on. Head over to the templar area. Don't forget to level blade vortex gem in a spare slot. You'll need to get some extra dexterity on gear (jade amulet) and/or take the Precision node. Take Herald of Ash as a quest reward and start using it. Go to the scion life wheel to get some extra life and regen. 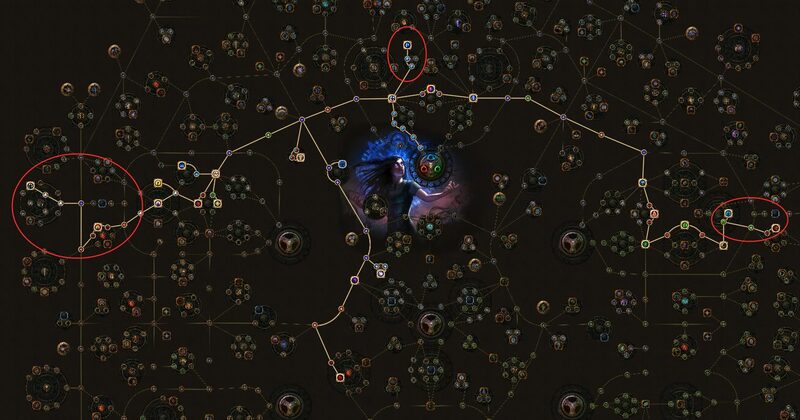 If using firestorm or BV as your leveling skill, take the duration cluster sooner rather than later. Take the Amplify node for extra AoE. 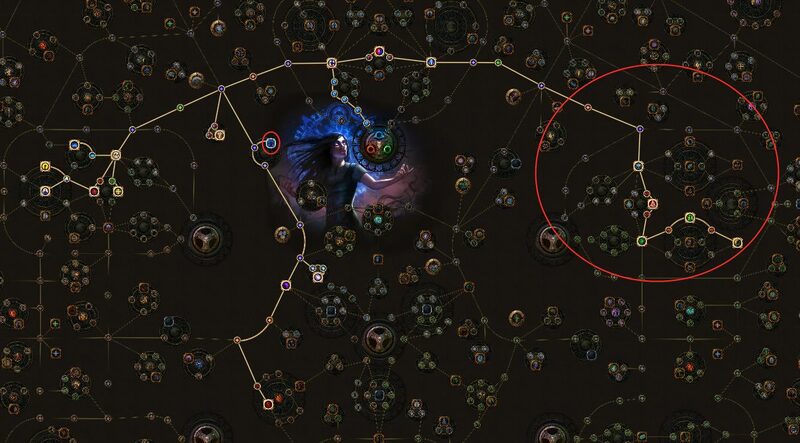 Do the first lab around level 35-38 and get the Pendulum of Destruction ascendancy node. Start using Blade Vortex. Recommended 4 link setup is Blade Vortex - Added Fire Damage - Controlled Destruction - Physical to Lightning. When you get 5 links, add Increased Critical Strikes support. You will also need a source of leech to solve the sustain issues. Do the Siosa library quest, buy Warlord's Mark and Blasphemy gems from him and use them along with Herald of Ash. Dexterity is becoming a bottleneck now so it is time to move towards the shadow area. Take a jewel slot and put Assassin Haste (quest reward) there. 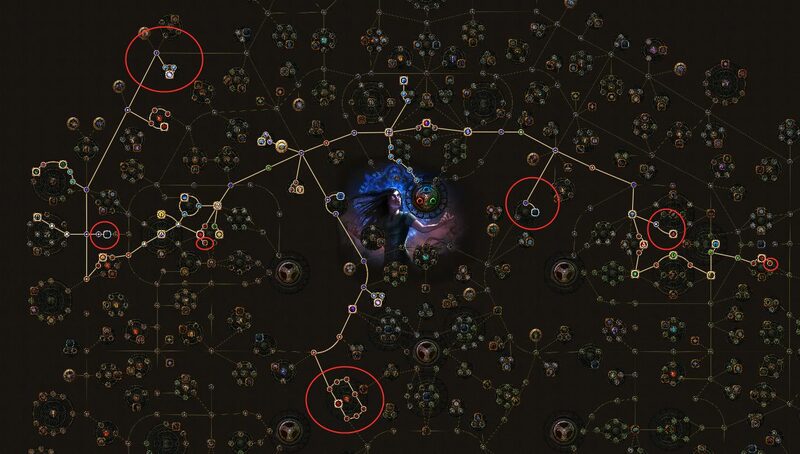 Do the second lab when you have around 2-2.5k life and take the Mastermind of Discord ascendancy node. Add Herald of Thunder as your second herald. 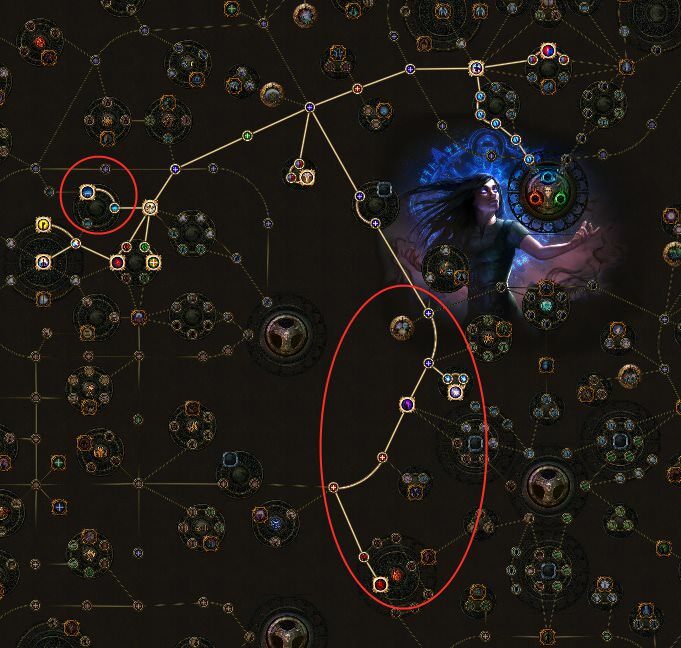 Take the Devotion life cluster in the templar area followed by the Celestial Judgement notable. Then take life nodes in the shadow area and then the Annihilation notable above the witch start. Buy Hrimsorrow gloves and switch to aura-less Warlord's Mark setup described in the Gems and Links section and start using all three heralds. It is probably a good idea to get MoM now. Take the Spiritual Aid cluster followed by Purity of Flesh life cluster. Follow the same strategy - alternate between taking damage and life nodes. Allocate jewel slots once you obtain decent jewels. After 107 points all that remains is to take the Acrobatics nodes (refund Precision at some point). Can I use Essence Worm with Hatred? Hatred adds around 15% more damage - very good indeed. However you are losing a ring slot that could provide over 100 life (with Coral ring) and 80-100 elemental resists. You will also not have enough mana left for MoM. If you are content with this trade-off and prefer to run a glass cannon version of the build - you can. The choice is yours. If we are talking about the end game however then the answer is no. You would be better off with the Mark of the Shaper ring paired with an elder ring - the damage bonus is the same if not better while adding some life and not reserving any extra mana. Is 5L Inpulsa's better than 6L rare armour? 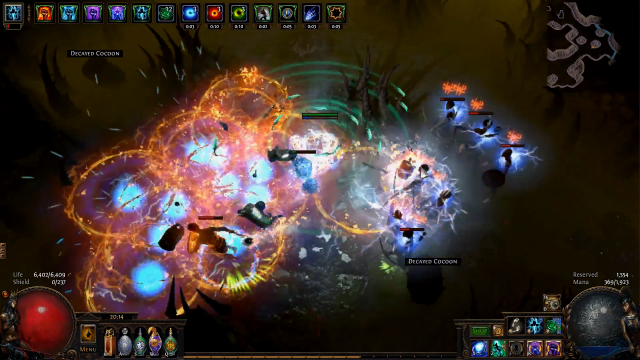 5L Inpulsa's is better as long as you've got the Beacon of Ruin ascendancy. Why take Mind over Matter if we don't have that much unreserved mana? Blade Vortex is precast which means that it still goes on and keeps damaging (and leeching) even if we run out of mana. Our movement skill is linked to Blood Magic so we don't need mana to use it either. While some extension to the life pool is always welcome, we take it to boost our recovery rate. Since we use leech as our primary defense mechanics, adding mana leech and mana regen increases our total recovery rate by 25-30%. How do I deal with chaos damage in Incursions? Swap for the Ming's Heart ring and use Atziri's flask liberally. Where do you get your mana sustain? and if it's on a shaper ring with warlords mark on hit, what would you do before you get one of these? 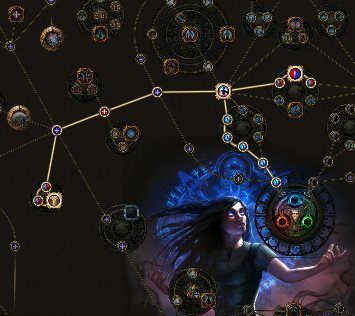 Very cool build, I am looking for a elementalist build and this looking very promising. Can you make your characters public so we can see the items you are using?